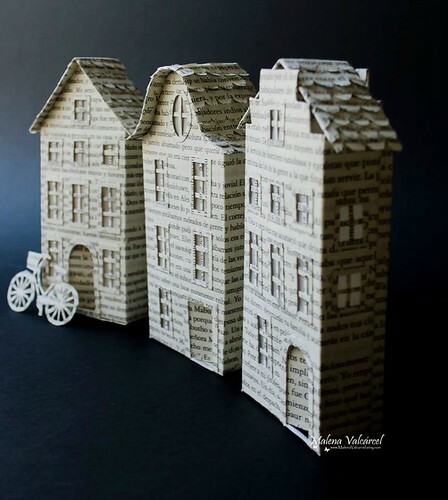 Today we'll travel to the Mediterranean city of Alicante, Spain to meet book artist Malena Valcárcel. I came across her lovely work on Pinterest and then enjoyed visits to her Behance page and blog. Malena's paper skills are completely self-taught. 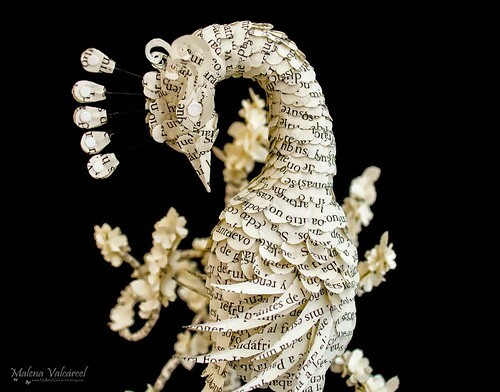 Her evocative sculptures are often inspired by everyday life. Some are lit from within and each is beautifully photographed. "Flowers, trees, butterflies, houses, clouds ... without forgetting the sea, really fascinate me. 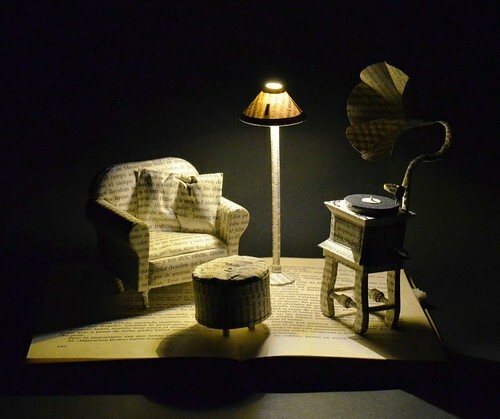 Turning books into sculptures, cutting and shaping paper into different shapes or abstract forms never ceases to amaze me and when the work is finished, just contemplating it brings a smile to my face." 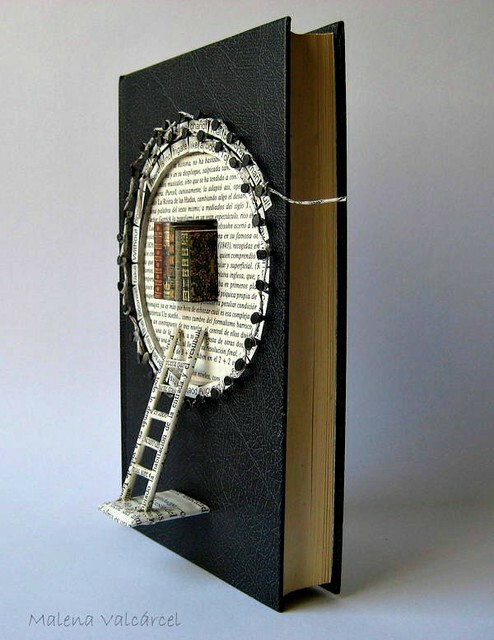 While there are always comparisons that can be drawn between altered book artists, Malena more than holds her own in originality judging by the diverse examples that feature stand alone figures, as well as exterior and interior dioramas. Many of her pieces include recycled materials. She says this is not just an ethical statement, but because they add authenticity and charm. Malena created this altered book as a tribute to Emily Dickinson, one of her favorite writers. It features hand cut words of Dickinson's poem, A Book. 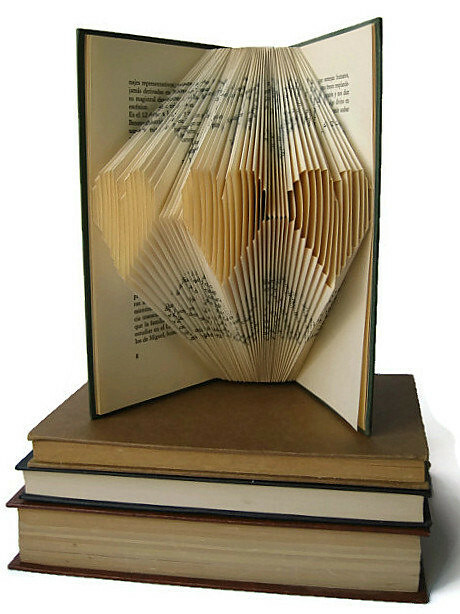 Because folded books are always a popular search term here on the blog, I wish I'd come across this one to showcase before Valentine's Day, but that's okay, hearts are nice all year round. 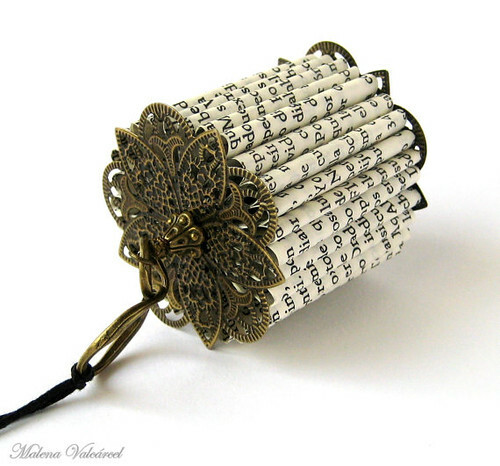 A tutorial to make one of your own can be found in her Etsy shop. 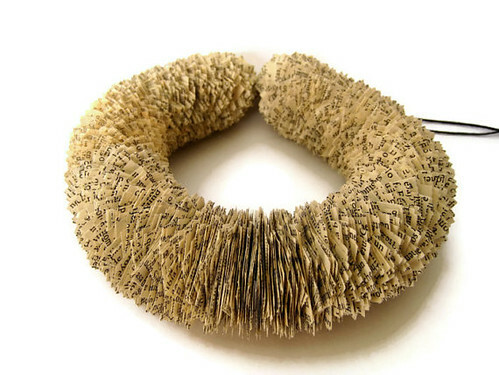 I was delighted to see Malena also creates paper jewelry from old book pages and pretty metal findings. This statement necklace is composed of hundreds of squares. It reminds me of a soft woolly caterpillar! Malena says, "Making things has always been incredibly important to me and it is often an amazing release to get it out of my system." 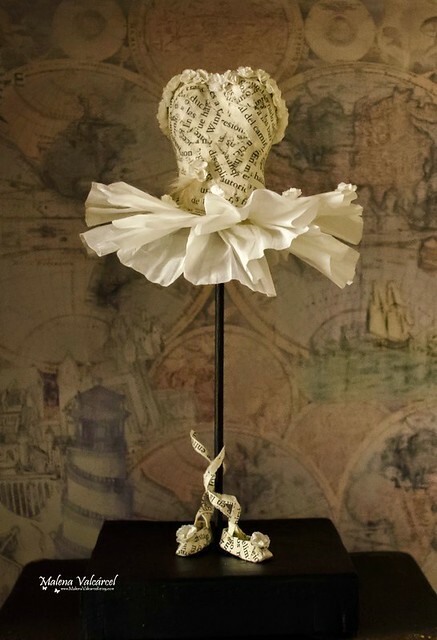 She created this necklace from the sheet music of a Spanish love song... I can't image a more appropriate first anniversary gift. Malena accepts custom orders via her shop or Facebook page. Marvelous and creative. I especially like that first artwork. 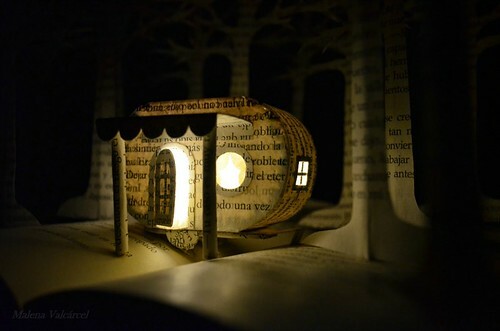 How beautiful, I particularly love the tiny magical scenes that are lit from within. Absolutely beautiful. I especially love the little houses and bike. Everything is so beautifully executed. I love all her work.